There is one beer whose clarity, complexity, and subtlety make it seem to me like perhaps one of the most difficult to brew and brew well. This style, maligned by both old-school hop-heads and newcomers to the world of craft beer, is the venerable Pilsner. I can understand why the Pilsner would be a difficult style, though, because until recently, I had similar feelings lurking in my beer-soul. Pilsners are usually described as well-hopped, but with today's hop-heavy IPAs, CDAs, and imperial beers, it is difficult to wrap one's palate around this golden style's hop character. The best way to approach a Pilsner tasting is to avoid any hoppy beers ahead of time. Hops can really be murder on one's palate, and when experiencing the subtleties of this style, you want your mouth and tongue to be fresh. Select several Pilsners and try them side-by-side. If selecting American varieties, at first steer clear of the heavier takes on it, such as the Victory Prima Pils, and try something lighter and cleaner, like Oskar Blues Mama's Little Yella Pils. Definitely include at least one Czech variety, and do not pass up the German classics such as Paulaner Premium. Pour your Pilsner into a genuine Pilsner glass, and give it a good, creamy head at least two fingers thick. The aroma should easily present to one's nose a complex bouquet of hops, an interesting yeast, and a promise of the malty delights to come. One should keep in mind that this beer is lagered for several months before being bottled, and that it was quite possibly one of the first clear beer styles ever brewed. Enjoy the Pilsner's beauty, reflect on the level of craftsmanship needed to brew and lager it, and sip slowly. After understanding these elements of the beer, it's perfectly all right to pour yourself a Mass of this wonderful nectar, and gulp away. My apologies for the dull administrivia, but I thought it would be a good idea to let everybody know that we've added a few new interesting technical features to the Leisure Nouveau weblog lately. reCAPTCHA is now being used to help screen comments. This is a great feature that uses your CAPTCHA input to help digitize old books, newspapers, and other media while also blocking spam. This also allows us to accept anonymous comments now. We are now using Gravatar's global avatars in comment postings, which allows our commenters to finally have nice little icons next to their posts. Various behind-the-scenes optimizations and changes have been made that hopefully speed up the performance of the website. It should be loading faster and running smoothly. We hope these various changes provide our readers with a more positive, easier, and leisurely reading experience here. Please leave us your thoughts and comments and let us know if there are any other handy changes we could make. Over at Cigar Aficionado's excellent Cigar Cinema, Jack Bettridge and Dave Savona share some excellent advice on pairing cigars with Irish whiskey. The cigar is one of their top 25 cigars, and is nicely priced at $6.25, but the whiskeys are all rather high-end. I am not an expert with the Irish whiskeys, but can say that in the past I've enjoyed Tullamore Dew quite a bit. You can watch the video by following this link. Make sure to check out Mr. Bettridge's excellent herringbone tweed jacket. Recently, I had the pleasure of visiting Mr. Maujean, fellow Leisure Nouveau writer, adventurer, and chicken farmer, and observing the great pleasure he gleaned from his new feathery hobby. After enjoying some delicious eggy bread and speaking more with him on the subject, I learned that there was quite a bit more to keeping chickens than meets the eye. He agreed to submit to a grueling, painful interview process, the results of which I am now happy to share. LN: How long have you been interested in raising chickens? What finally got you to start doing it? CM: I wasn't really interested in chickens until we decided we were tired of paying for eggs, and that we'd get better eggs if we were raising them ourselves. The true impetus was that grandpa bought us the chicks and some starter gear. 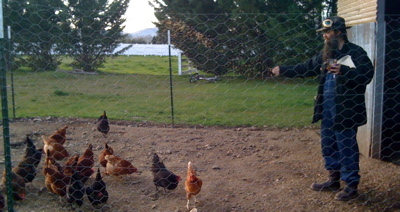 Continue reading Interview with a Chicken Farmer. Last weekend, our intrepid beer sleuths (that's Vera and I) managed to visit eight Oregon breweries in four days. This isn't such a huge feat if you're in Portland, but we didn't travel within 100 miles of that fine metropolis. First we visited Newport, and then Eugene. 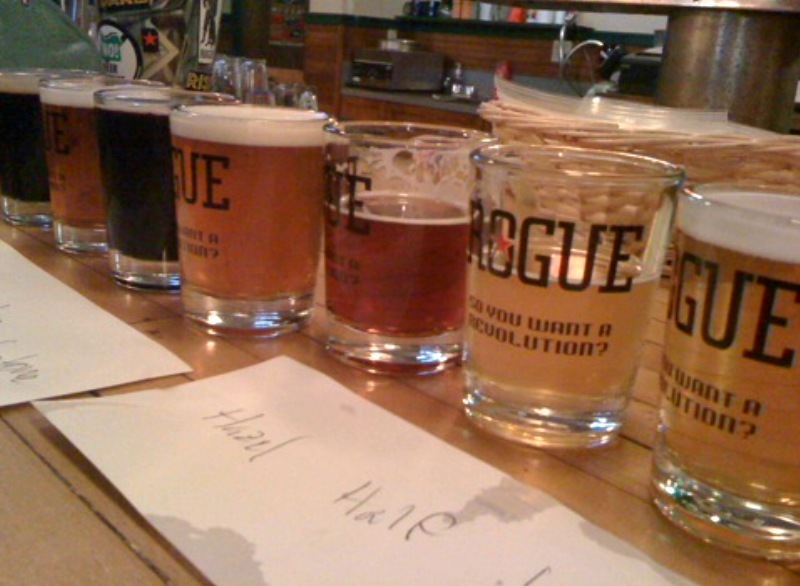 Newport is home to Rogue Ales, perhaps one of Oregon's most famous larger microbreweries. Their beer is incredibly popular, and after tasting over a half-dozen of the varieties they had on tap, our favorites ended up being the smokey, slightly spicy Chipotle Ale and the remarkable estate beer, Dirtoir Black Lager. In Eugene, we met up with New Belgium Beer Ranger Ryan Stahel, who gave us plenty of tips on breweries to visit, beers to try, and things to see. It being just a little over a month after the KLCC Microbrew Festival, everybody had their KLCC Collaboration Beer on tap. This beer is an incredible Cascadian Dark Ale made with four varieties of hops, a portion of rye, and a Belgian yeast. Continue reading Eight Breweries, Four Days. In 1998 or 1999, I had the opportunity to sample Samuel Adam's legendary Triple Bock. It was in its cobalt-blue bottle, poured into snifters. I had certainly tried quite a few beers back then, but was not as much of a beer nerd as I am now. I remember the beer was viscous, flat with a dark, murky color. It smelled rich, sherry-like, and intense, but to me seemed overwhelmingly odd and syrupy, and thus undrinkable. I have since had a number of ultra-strong beers, including the World Wide Stout and 120 Minute IPA from Dogfish Head, the Goose Island Bourbon County Stout, Deschutes Abyss, and others. To my palate, they range from sticky, sweet, and only good for the novelty, to really impressive examples of the craft of beer. And I am sure that, like the various imperial styles, brewing such intense beers really helps brewmasters understand more about the process and their recipes. Currently, however, there seems to be an arms race in the brewing world to make the strongest possible beer. BrewDog in Scotland and Schorschbräu in Germany are at the head of the race, popping out beers that are actually surpassing 80 proof. These beers push the definition of "extreme beer," and though I doubt I'll get a chance to try one anytime soon (the Schorschbräu Schorschbock costs around $150), I'm also not sure I would really leap at the opportunity to have a bottle around every day. The reviews make them sound interesting, but not exactly drinkable. We at Leisure Nouveau would be very interested in hearing from readers who have tried one of these extreme beers. Please leave us a comment below. The bright afternoon sun filtered through the Lodgepole and Ponderosa pine to illuminate the workshop of pipemaker Brad Pohlmann. Though it looks to be a classic false-fronted shop out of the Wild West, it was created relatively recently by the former owner of the property as a painting studio for his wife. Now, it is filled with the tools of a master pipemaker. The walls are sparsely adorned with pipes and smoking memorabilia, and boxes of briar blocks sit beneath smoke-filmed windows that look out over Pohlmann's beautiful Applegate-valley property. The three of us had loaded our bags with beer, tobacco, and the trappings of smokers, and made the long-overdue drive to the valley to visit Pohlmann. We used the excuse of celebrating his selection as Pipes & Tobaccos Magazine's Pipemaker of the Year, and the arrival of Daylight Savings Time, but in truth, we'd been planning to visit him for quite a while, and were just now getting around to it. 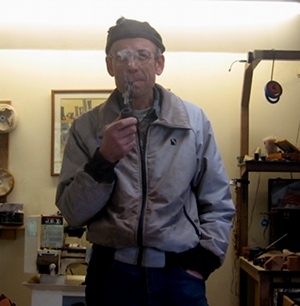 Pohlmann moved to the Applegate Valley in Oregon in 2004, and sometime in 2006 or 2007, Jesse Williamson came to me eagerly, that excited gleam in his eye, saying, "Erik, I've discovered a pipemaker! He lives here!" Continue reading An Afternoon with Brad Pohlmann. I know that Mr Maujean spends quite a bit of time doing burpees, which it would be great to hear more about, and it's odd to think of exercise as being an important part of leisure, but it is. My own exercise, when I get around to it, consists primarily of hiking, walking, and riding my rather heavy bicycle. However, The Art of Manliness recently posted an article called The Odd Object Training Primer that includes a number of exercise ideas that sound rather entertaining. In Southern Oregon we are blessed with a number of really excellent local breweries. Some are well-known outside of the area, such as Ashland's Caldera Brewing and Medford's Southern Oregon Brewery (SOB). 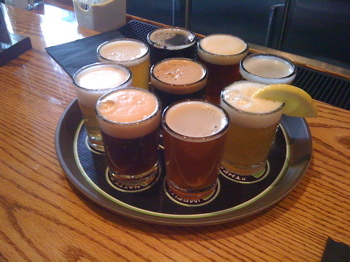 Others, like Walkabout Brewing in Central Point, are primarily loved by the locals. This weblog is loth to pick any one as a favorite, but does wish from time to time to single out one of these breweries for a job well done. The 2008 Barleywine from SOB is a beer we would particularly love to call your interest to. This bourbon oak-aged beauty was just bottled and released this year, and a scant two dozen cases were all they produced. Inspired by the more traditional English-style barleywines, this beer eschews the heavy-handed hops that have become characteristic of the American-style, and instead adds such treats as the oak aging and plum purée. The flavors combine spectacularly. On the nose, this beer promises a rich, warm draught, and it does not disappoint. The oak blends well with the sweetness of the malt, and if the brewery hadn't admitted to the plum purée on the bottle, one would assume the hint of dark stone-fruit was just another bonus flavor. It is rare that one comes across a beer that longs to be savored so slowly. It begs to be enjoyed in a snifter, perhaps shared with food, or perhaps as just a dessert beer. And though the oak may still be a wee bit overpowering, with a few more years in the bottle it should mellow out and sink pleasantly into the brew's rich, malty warmth. Tom Hammond, president of SOB, recommends wax-dipping any bottles one plans on aging, to guard against oxygen seepage through the bottle cap. Presently this beer is available in extremely limited quantities at the brewery and perhaps throughout the rest of the state. Pipe tobacco comes in a variety of blends, cuts, and flavors. One of the most difficult for the beginner to smoke is probably flake tobacco, which is delivered in dense, long strips of leaf that has been pressed into cakes and then cut into this odd shape. When properly prepared, this form of tobacco can provide a cool, slow-burning, and satisfying smoking experience. Continue reading How to Smoke Flake Tobacco. We recently added a new domain alias to Leisure Nouveau, so that all of us (including myself) no longer need to remember how to spell the damn thing. The new domain name, LNouv.com, is easy to remember, easy to type, and fun to say. Next week we plan to return to a Monday, Wednesday, Friday publishing schedule again. Expect to see some interesting interviews, lifestyle articles, coffee and wine reviews, and even some articles about travel. Thank you all for your patience, and we at Leisure Nouveau are very sorry we've been away for so long.